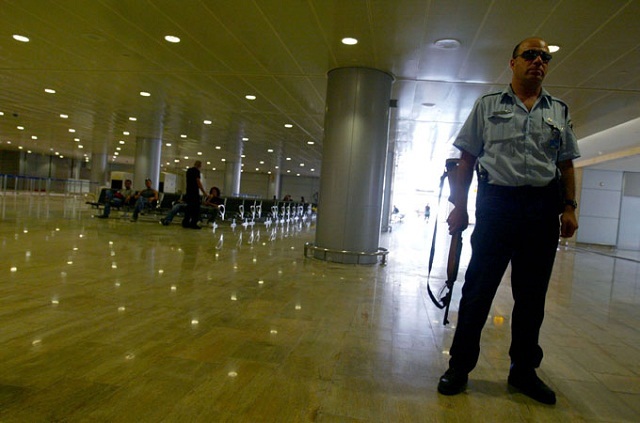 Amna Khan reports on the discriminatory interrogation she faced at the hands of immigration officials at Tel Aviv's Ben Gurion Airport and argues that, although her treatment might sound all too familiar to some, it should not be allowed to become normalised. I was already prepared to get interrogated by immigration officials when arriving into Tel Aviv Airport because, unfortunately, I knew that it was a standard procedure. I had read many online stories about people being denied entry to Israel and numerous friends warned me about what was likely to lie ahead. Still, the whole questioning ordeal has been so beyond my already-gloomy expectations that it has fuelled me to share my experience. We arrived into Tel Aviv on Friday at around 4:30pm and were immediately split up. We were a group of seven students and had never been to Tel Aviv before. Four of my friends got through immigration fairly swiftly, although to begin with they had some difficulty passing because they were with us. The rest of us were asked to wait on the side, after having just shown our passports. I stopped for a moment, as there was nothing I could do but see the deep prejudice against us. We were just three British Pakistani girls who had Muslim names, but it became evidently known from the very beginning that was the only reason we were being stopped. We were anxious of what to expect and what they would ask us, so I decided to go up to one of the immigration officers and politely ask him how long we would have to wait; especially as our friends were waiting for us on the other side. “This is not a time for questions”, was the blunt, cold response. From that point on, the whole process of waiting and answering questions became a pointless, time wasting and a somewhat degrading experience. We were each asked in turn to go up and be questioned. The first round of questioning was simple: they wanted to know what the purpose of our visit was, what we were doing here and where we were going. Then the personal questions about my parents began, where were they born? When did they move to the UK? What do they do? What about your grandparents? As these questions went on I started to realise that they didn’t even care. They were acting as if they weren’t even interested, making jokes in Hebrew with their colleagues, whilst I uncomfortably had to answer irrelevant questions about my family. Once we had all individually done the first round of questioning, we waited another hour before the second round began. While we were waiting we began talking to some of the other people waiting in immigration and we laughed at what a joke it was, mostly because we didn’t want to let the anger take over. Almost everyone waiting with us was from a different ethnic background. It was a clearly selective and racist process. What caught my eye in particular was this one Palestinian family. The father was very old and frail and was taken to the furthest room to be questioned. I sat and watched him struggle with his walking stick to the room, whilst his son had his two hands out, eyes closed, as if he was praying. The daughter, who looked much younger, seemed completely frightened, not knowing what was going to happen. I began feeling this sense of separation and hostility. Wondering if this was a small taste of apartheid. Although, I hadn’t even stepped outside of the airport, the situation made me feel very helpless. I had no authority over myself at this point; I felt almost like a puppet in the hands of the Israeli authorities, following their orders. The second round of questioning was very intense and was meant to make us feel a lot more intimidated, as things were now getting serious. However, just as before, it was still all rather pointless. They seemed adamant to find out when we were leaving the country. We told them the dates and the flight that we had booked but that wasn’t enough. They asked us to give them our boarding passes for our return flight. We didn’t have these with us, because on Easy Jet you cannot print them out until a couple of days before the day of your flight. We tried to explain this several times but that didn’t work. One of the officers who was interrogating my cousin, asked to check her e-mails for the flights confirmation. She refused to do so, as it was not only a violation of her privacy, but – because I had booked the flights – she didn’t have any of the information anyway. To prove that we were flying back to Luton in two weeks we logged into our Easy Jet accounts, which clearly showed all of our flight details. However, this one officer was still not convinced, and was determined to get our boarding pass number. It had now been three hours of questioning and interrogation. Everyone around us was beginning to leave. We began to panic as there was nothing else we could do. As if that wasn’t enough, they continued to make jokes around us, making us feel uncomfortable and incredibly insecure about the whole situation, as if we had done something wrong and should feel guilty. They asked us again what places we were going to visit, when we mentioned Jericho, they just laughed and said “where’s that?” This was beyond ridiculous; Jericho is near the Dead Sea, the number one tourist attraction in the Holy land. To pretend they didn’t know the place was both disrespectful and an insult to our intelligence. Fortunately, before planning our trip we managed to get a letter from a British official based in Jerusalem. The letter stated that we were part of a twinning organisation and would be meeting with him during our visit. We were hesitant to use this letter immediately upon arrival, as we optimistically thought we wouldn’t need to. Realising our optimism had been unwarranted, we produced the document. As soon as we showed the letter to the immigration officials, a whole hour of them being fascinated with our return flight arrangements suddenly evaporated into the summer air, suddenly transformed into a completely trivial detail. Of course, they had no reason to be questioning us in the first place. When we were told we could go, the sudden feeling of freedom regained was unmistakable. We left the immigration waiting room, which was now almost completely empty. As we did, I exchanged a smile with the Palestinian girl who was still waiting for her father. It was the first time I saw her smile or even look at us. Although she didn’t know if she would be getting in, she was evidently happy that we were. We left and said goodbye to everyone else waiting, wishing them good luck, as others had done before us. We were very fortunate to have had those letters – and the authority they carried – with us. Had we not, I really don’t know what would have happened to us. Sadly, I’m not surprised this has happened to us. Our rights as British citizens should override Israel’s discriminatory process against us. We had done nothing wrong but shown our passports. No one should have to be subjugated to this totally unjustifiable interrogation, based on the colour of your skin, ethnicity or religion, but it seems that we have to because it’s become so normalised. Amna Khan is a writer and activist based in the UK. Salaam Sara. I had some slight interaction with palsoc nott’m a couple of years ago. In Britain, as – in their eyes – a leftist Paddy, I had a very curious experience crossing borders via the Irish sea in August 2001. The story about Jerry Rubin in above article is very funny. I found myself in the same situation as you last November when I arrived in ben gurion airport. out of all the passengers me and my family were the only ones that were interrogated just because we were Muslims. the fact that we hold British passports means nothing to them. to add salt to our wounds, they ripped up the pieces of paper with our visas on., so we were interrogated every time we crossed the border between west bank and Israel. blatant discrimination. I am just back from Israel, I am latino with German Passport, and had almost the same issues, private questions, especially they were very concerned why do i have a german passport? and other stupid questions, at the end I allowed myself to tell them that they are stopping me because of my skin color! because they assume stupid things like with the salary I have , someone can’t afford travelling, so then again they asked me if Do I carry drugs in my stomach? I have travel a lot of times around the globe, but this is the first time I felt discriminated! All what I can say is that they haven’t learnt from their past …. You were interrogated because of your skin color…? What skin color is that? Purple? Or brown JUST LIKE THE GUY STANDING IN THE PHOTO? Yeah, I’m gonna go ahead and say that it had absolutely nothing to do with your skin color. Sounds like you have a chip on your shoulder because you’re a Muslim and Muslims are the only people trying to blow up Israeli airports. Ben Gurion is the safest airport in the world, so obviously they’re doing something right, and probably had a good reason to stop you. Rights as British citizens??? What the hell? YOU’RE NOT IN BRITAIN!!! Did anyone tell you that? I have just come from Israel. 20 years ago I went also and they interrogated and intimidated me for 3 hours. I told myself at that time that my foot would never step there. I had to go again this year 2014. Nothing has changed – by chance they interrogated me for 15 min but the sort of questions show how obsessed they are and sick in their minds. They have created themselves a prison in which they live and by their sick attitude of suspicion and humiliation they create their enemies around. No wonder!!! I am glad that I do not live there. Pakistan is not even supposed to be a country. India was divided as part of the British Colony and Imperialism program: conquer and divide. Just as they divided Iran and Afghanistan. Secondly, Islam is not even supposed to be in Iran, Afghanistan, Pakistan and India. These lands were conquered and forced to convert to Islam by the Arab Muslim Conquest. In The Avesta, holy book of the religion Parsuism, Profet Zarathustra, clearly explains that land areas between river Tigris and Indus has been given to the Parsus/Parsees, by God, Ahura Mazda. The land further divided into 16 smaller pieces, all with a name, mentioned in the Avesta. The hymns in the Rig Veda, also clearly state, that these lands, betwenn Tigris and Indus and Indus and Bay of Bengal, is for the Aryan Tribes, named in the Rig Veda, two of which, the Parsus and the Hindus, still exist. I am a Christian Indian, who had to go through the same humiliating experience in Saudi Arabia and my bible was confiscated and thrown away. It was a gift my mother gave me. I was treated worse than an animal and treated with utter contempt and hate by Saudi authorities. Pike, If Indians were forcibly converted to islam then why is India still 80% Hindu?. This notion that lands between Tigris and bay of Bengal were populated with hindus is nonsense.This is myth perpetuated by Indians,there is no historical evidence for it.Hinduism and Indian history is shrouded in myths.As for partition ,this was a good thing.Its a pity that India was not divided into several countries.India was never a single country.The British should have made every indian (pre-partion) state separate country.